Do Prefab Camper Vans Have What it Takes to Be a Bug Out Vehicle? This is an interesting kit for those of us that are always looking for a better bug out vehicle. If you’ve ever looked into getting a custom conversion van built, you know the waiting list is often many months old. These kits are specifically designed for the Ram ProMaster City, which run about $25K brand new. Add in the $13.5K from the conversion kit and you’re looking at a bug out vehicle that’s around $40K brand new. That’s no small chunk of change but it’s doable for many people. If you’re seriously looking at using a conversion van as a bug out vehicle, or even as a small recreational camper, these kits from Contravans could be just what you’re looking for! Colorado-based Contravans aims to make the process much easier with simple van conversions that take about two weeks. 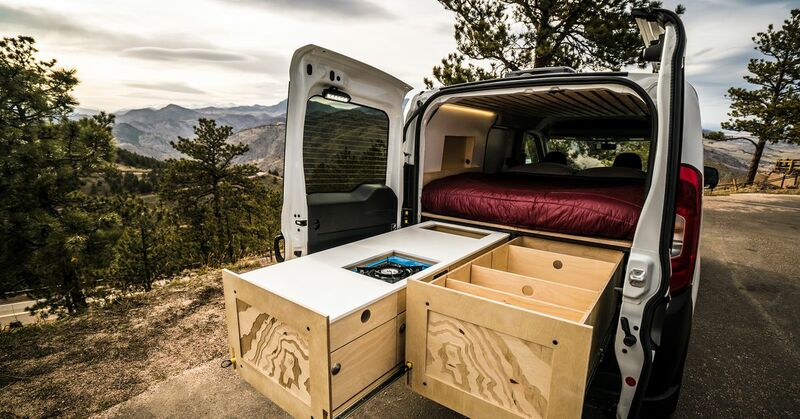 Contravans is a team of conversion builder Vanlife Customs and the Denver-based rental shop Native Campervans. Using the two companies’ combined experience, Contravans is building prefab conversion van kits for the Ram ProMaster City chassis. The Contra-Kit features a two-person full-sized memory foam mattress and a retractable kitchen and storage system that uses two sliding drawers accessed from the rear doors. The kitchenette includes a five-gallon water jug and a single-burner propane stove and cooler, while the 6.75 cubic foot drawer can hold lots of clothes, gear, and camping supplies. The design upgrades the normal van ceiling with a slatted wood ceiling, wall panels with cubbies, and a deluxe remote operated ceiling fan with rain sensor. Two 12v power outlets and LED dimming lights run off of a 100ah auxiliary battery system and 400-watt inverter, meaning the whole system can stay off the grid for short periods of time. The Contra-Kit costs $13,500 and includes installation, bedding, cooking and eating tools, and camping chairs and a table. The design is simple and compact, partly because the ProMaster City is smaller than the the full-size ProMasters often used for conversions. Have anything you think we should cover? Send us a message and let us know!